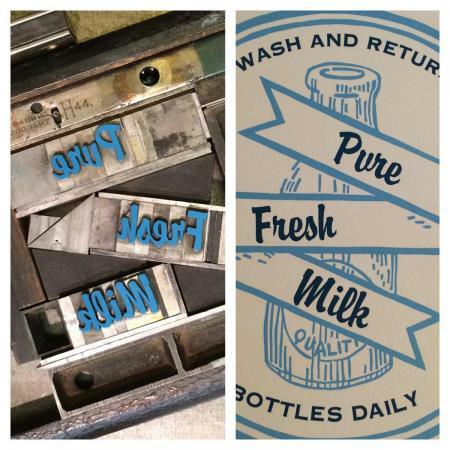 The Summer Workshop Season is here, and the Morgan Conservatory has several dynamic letterpress workshops included in the schedule. Additional workshop descriptions, instructor/artist biographies, and registration are available online here http://www.morganconservatory.org/workshops-by-category. Symmetry. Color. Abstraction – these artistic elements have attracted artists throughout history to using botany as a subject in their work. This two-day letterpress workshop will allow you to render beautiful abstract flowers by printing wood and metal letterforms using repetition, symmetry, and a mix of wild colors. You will be able to create at least one flower composition, while making enough copies to exchange with classmates at the end of the workshop. No prior letterpress experience is necessary. Cost is $185 and includes materials. Create text that curves, angles and bounces in this typesetting and letterpress workshop that moves beyond straight lines. We’ll explore traditional methods of employing circular and angle quads, by adapting tools from hardware stores for manipulating type, as well as experiment with Daredevil Furniture, a set of laser cut furniture recently designed for type composition at Springtide Press. We’ll conclude with an exchange of daredevil prints. This workshop is appropriate for those with some letterpress printing experience who want to expand their approach to typesetting and image-making. Cost is $230 and includes materials. Looking for something a little bigger? Join Bob Kelemen for this unique opportunity to design and print a project using oversized wood type. In this workshop, you’ll get the chance to utilize the Morgan Conservatory’s extensive collection of oversized type (some measuring nearly two feet in height!) in order to make prints and learn letterpress printing techniques. Participants will learn how to properly ink, proof and pull a print, and will have the chance to experiment with this vintage collection. No prior experience required. Cost is $160 and includes materials.